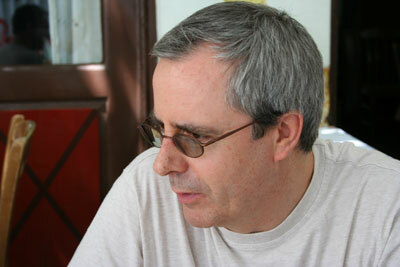 With three critically-acclaimed crimes series under his belt, Paul Johnston is frequently compared to Ian Rankin. 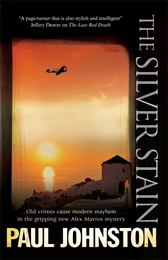 Johnston’s latest offering, The Silver Stain, the fourth in his ‘Greek series’, continues in the same intoxicating vein as its predecessors with its heady mix of missing persons, buried secrets and an unnervingly noir Cretan landscape. Returning to the fold is protagonist Alex Mavros, a half-Greek half-Scottish private-investigator whose tempestuous family history and fiery heritage has bred a taste for mystery and danger. It comes as a surprise, then, to find Mavros, however grudgingly, living the quiet, domestic life in Athens with his girlfriend Niki, following the explosive action of The Golden Silence. That is until Mavros is called upon by a Hollywood film company to find a missing employee on the site of their shoot in Crete. With the big-budget film about the 1941 German invasion of the island opening up old wounds amongst the residents, what should be a straightforward case for the maverick becomes a descent into a world of violent hatred. Kidnapping becomes just one of Mavros’ problems as he becomes acquainted with the dark underworld of Crete, teeming with thieves, corruption and murder. Then, as past crimes merge with the new, Mavros finds his own history intertwining with the horror. It’s this quick pace that is one of Johnston’s greatest assets. Flitting coherently between Mavros’ narration and the memoirs of an ex-Nazi (as well as others), the structure is sharp and taut, never feeling slack or over-burdened by the details it packs into itself. Johnston ably maintains the suspense and keeps clarity, partly because of his smorgasbord of rich, multi-layered characters, including a selfish, egotistical Hollywood director and a ballsy leading-lady, German hotelier Rudi Kersten and cab-driver Mikis. Of course, it’s the main man Mavros who’s got the real pulling power. Despite having been, to quote his creator, “confined to a wooden box” since 2003, it’s easy to see why Mavros has been brought back to life. A true noir detective, he’s fallible and fearless, opening his mouth and taking the punches, with an eye for hidden details and a habit of getting himself into sticky situations. In a novel with more than its fair share of USPs, he’s the pick of the bunch. Following closely behind Mavros in star-wattage is the locale itself. Striking in its unfamiliarity in crime fiction, Crete becomes a distinct character itself. Yet, Johnston doesn’t slam landmarks into the readers’ faces or linger unnecessarily upon Greek scenery and history. This is not a brochure for touristy Crete. Rather, this island is as shady as any dark city. This dark side of tourism, a pointed yet subtle reminder of blasé consumerism, reminds us that nothing is what it seems, overwhelmingly potent if we consider the current economic climate in Greece. Though written and set closer to the Olympic Games, and distanced from contemporary events by Johnston in the author’s note because of his timeline, The Silver Stain can’t help but resonate prophetically. A world tainted by commercialism and corruption and desperately trying to paper over the cracks, Johnston’s novel is so close to the bone on occasion that it’s coursing through the veins. Unafraid to tackle big subject matter, from World War invasions to contemporary fascism, drugs to corruption, The Silver Stain is a pulsating crime novel from start to finish. Brimming with fresh takes on genre tropes, it’s deceptively unnerving and provocative. It’s fair to say that come the final page, it might be time for a stiff ouzo.